Oh, my gosh, peeps! I've got the cutest DIY Birthday gift idea for you today! 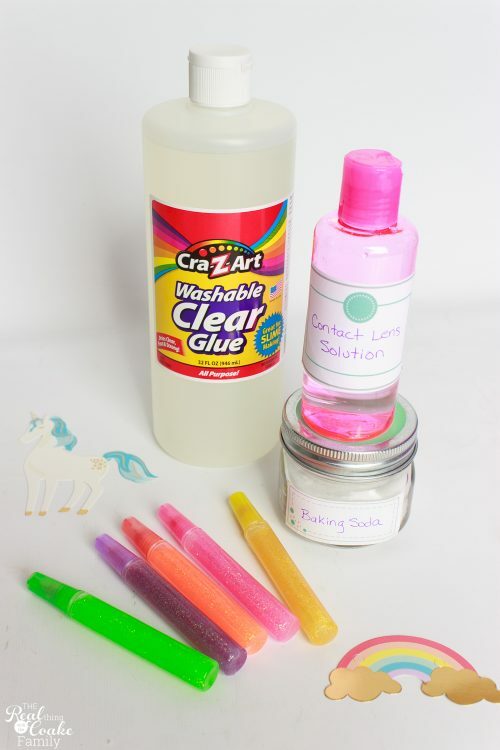 You will need some crafty supplies in order to add the unicorns and glitter to this gift. You will also need a little bit of time to prep things. So don't wait until the hour before the party for this one, but I know it will be totally worth the time in the end. I based the things that went in our slime gift on this slime recipe from Elmer's. 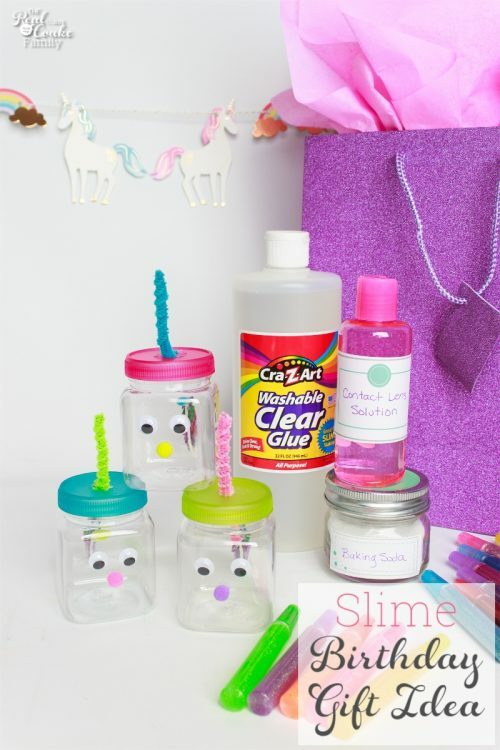 Vary the things that you put in your gift based on the slime recipe that you use. Now, if you noticed in the first picture, we added little containers to the gift to hold the slime once it was made. We made the containers look like unicorns. When we were making them, literally the hardest part was figuring out the best way to make a unicorn horn. I tried quite a few different ways and nothing really looked right. Finally, I robbed our stash of pipe cleaners for our homeschool projects and came up with something that worked. You will want to start by bending your pipe cleaner at about the 2″ mark. Then bend it back and forth a few times to make that “M” shape you see above. 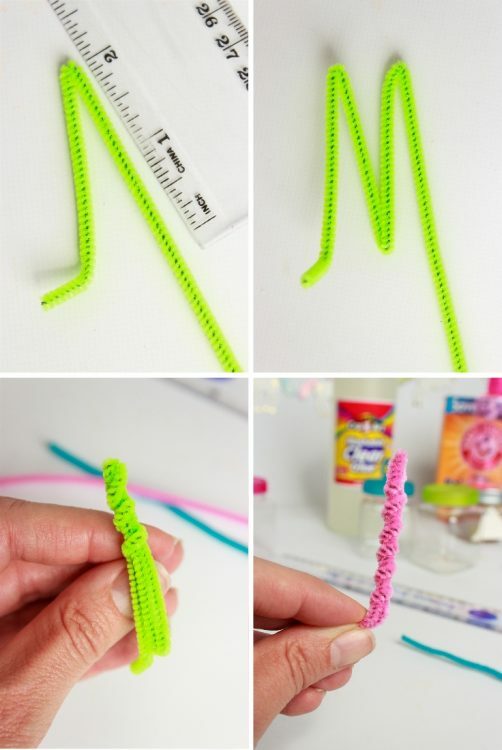 You will squish that M together and actually wrap the remaining pipe cleaner around it. That kind of gives the ridge look of the unicorn horn. It works a little bit better with fluffier pipe cleaners. We had run out of them by the time I made this set to show you. 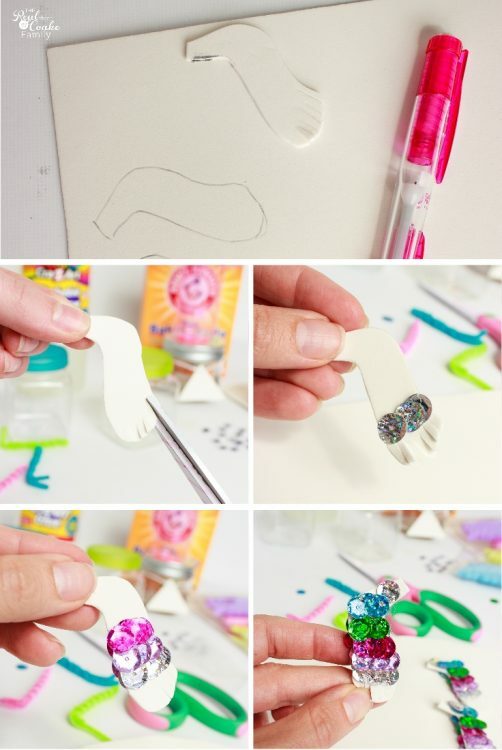 Now, you will want to add a sparkly unicorn tail. Using craft foam, trace out a tail shape. Cut it out and add small cuts at the end to give it a little more of a feathered tail look. Finally, use sequins and add them a row at a time to the tail to add the sparkle. Please use caution with this part. The sequins with the hot glue make a VERY hot combination or maybe something went wrong with my glue gun. Not sure exactly what happened, but I got the worst hot glue gun burn I have ever gotten making the tail. I still have a nasty burn blister. So make sure if your kids are making this that you help them with this part or try some other kind of glue instead of hot glue. 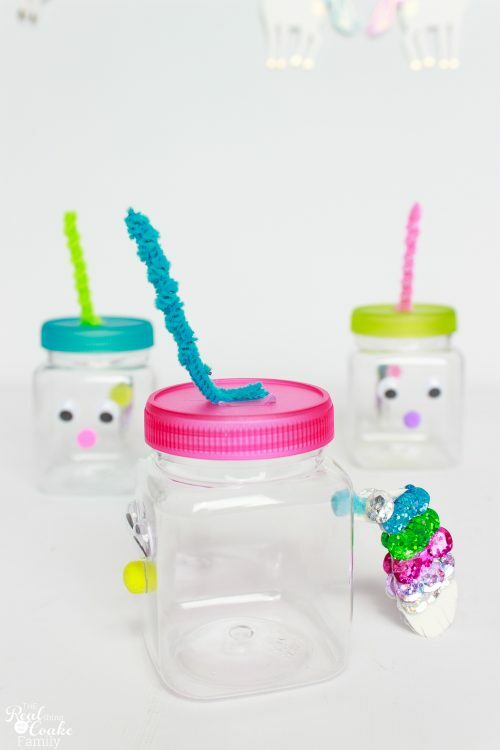 You will use hot glue to add the unicorn horn to the lid as well as the eyes and the nose to the front. I like using this little hot glue gun finger protectors(affiliate link) for things like this (especially after my bad burn this time). The little silicone caps protect your fingers while allowing you to press the unicorn horn into the hot glue. For the tail, take scissors and snip the little pom poms open just a bit. Add a dab of hot glue into the area you just snipped open and push the tail into that space. Once that has had a chance to dry and set, add a dab of hot glue to the other side of the pom pom press it to the container. 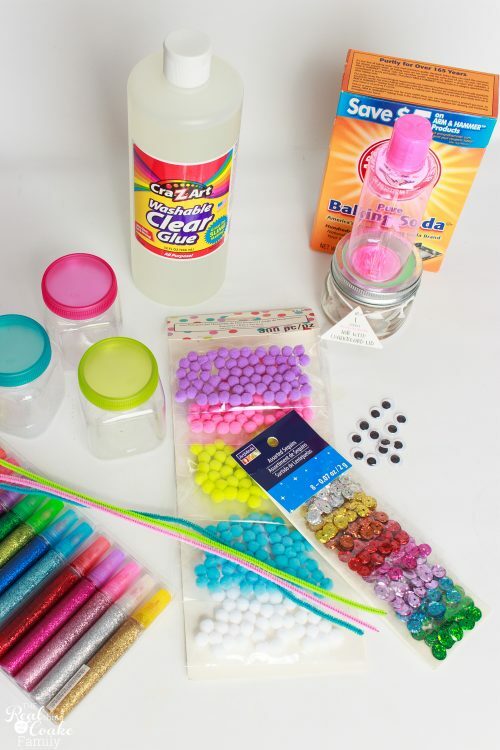 For the other parts of the gift, you will want to add the ingredients you need to make slime. Again, I followed this recipe from Elmer's. I like that recipe because it seems the safest and non-toxic to me. In addition to needing glue, the recipient will need contact lens solution and baking soda. We used little containers from the dollar and travel spots at Target for the baking soda and contact lens solution. I used the labels in my shop (labels bundle and pantry labels or both are in this big organization bundle) to add to them. They matched the color theme I was going with and I'm telling you the labels in my bundles have so many uses they come in so handy. I've used them in my kitchen pantry, family cleaning schedule and in our recent craft cabinet reorganization to name just a few of the ways I've used them. I just print them off on full sheet labels (affiliate link) and cut out what I need. 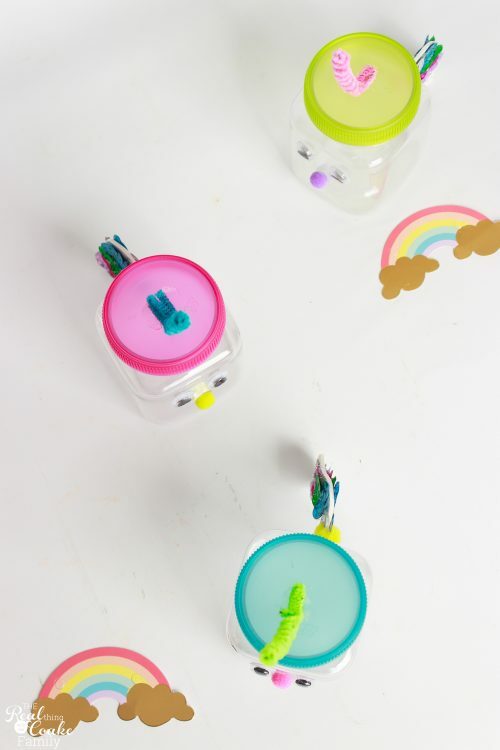 In the end, you have these adorable little unicorn containers. Oh and by the way, I got the cute little containers at Michael's. They came in a three pack. Hopefully, I didn't disappoint you. We thought this was the cutest gift! I totally loved that my daughter had so much fun in making it and getting it ready. Sometimes that makes a great gift in and of itself, just to see my daughter enjoy making something special for her friend. Then the icing on the cake was that her friend loved it! 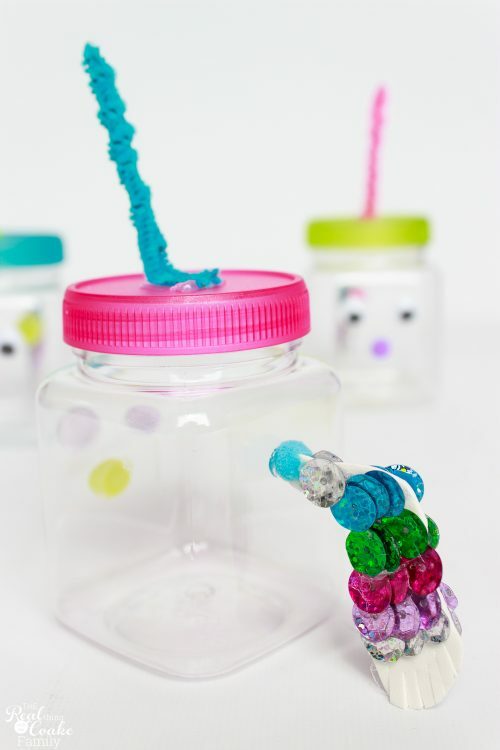 Have you and your kids made any simple DIY Birthday gifts? What were they? We would love more ideas, so leave us a comment below. Ohh that’s fun!! I love giving kdis the kinds of gifts that they can make, or come back to over and over because they are so unique!! What a really cool idea, and I’ll bet it’s going to me a gift that stays in the memory for a long time! Found you at a link party, glad I stopped by! Great idea! Thank you for sharing at What’d You Do This Weekend? Hope to see you back next week! I think making it with the children is the best part of all. The result is so cute. Thanks for sharing with us at #overthemoon link party. I’ve pinned and shared. Have a great week and hope to see you link up next time. Sue from Sizzling Towards Sixty & Beyond. So Cute! 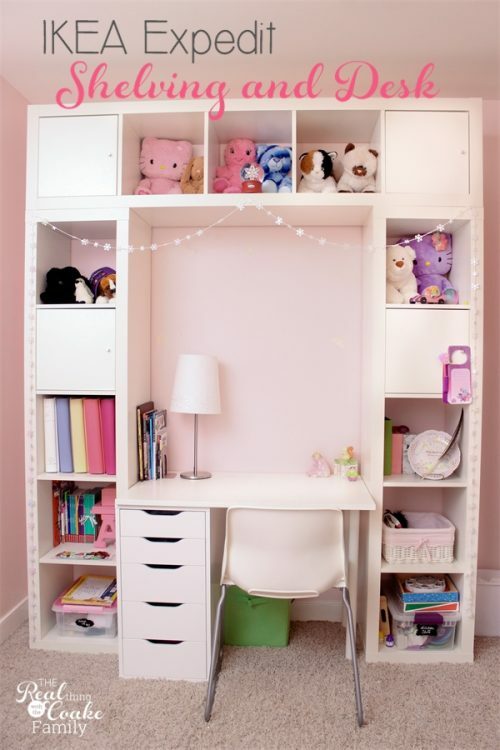 Amazing fun DIY ideas for kids. Loved it. Thanks for sharing. Thanks so much! Thanks for taking the time to let me know you enjoyed this post. Have a great day!